The 2015 release of Juice Machine is a re-worked recipe for a beer of the same name that Tree House debuted at Extreme Beer Fest in 2014. Boasting over 6lbs of American, New Zealand, and Australian hops per BBL, this little bugger has been demanding quite the return on trade forums. It's a Tree House IPA, so at this point I expect a damn good beer, but how much better can these keep getting? Pours the typical dark orange frappe-looking body that unfiltered New England IPA's have become known for. I got less than two fingers of white head. Overly ripe peach and melon on the aroma. I don't quite get an orange flavor, but more like a clementine. A touch of white wine and grapefruit are there too as are strong malt qualities of pilsner and breadiness. The taste goes right back to the peach, but has noticeable sweetness. A feeling of sugar-sprinkled grapefruit might be the best comparison here as the flavors of the Australian and New Zealand hops are putting out a lot of energy in this one, but this isn't the typical juice bomb from Tree House (despite the beer's name). At the middle of the mouth, there's a actually a touch of hop bitterness akin to grass, but it is ushered away quickly with a splash of honeydew melon. The finish (believe it or not), actually hits me with a small resinous bite. I will say that the mouthfeel is noticeably dry. If this is made with pilsner malt, then that would explain the Sahara situation going on here. However, it isn't a deterrent and this is still another easy drinker from Tree House that sports a creamy feel and no presence of alcohol. 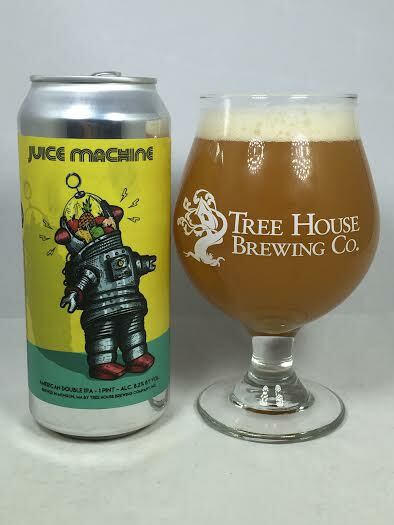 Juice Machine definitely has moments of juice, but it didn't out-juice other IPA's that they produce on a regular basis. I still enjoyed this beer for those fruity flavors and the creamy feel, but I wouldn't sell your soul for it like a lot of people seem to be doing.